I have been working, almost exclusively, towards my next CD for some time. 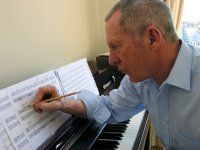 I first set pencil to paper before the release of the Three Piano Sonatas in September 2014 although ideas germane to what I was slowly edging towards, together with the inevitable associated doubts and uncertainties, had been ricocheting around my head for many years prior to this point in time. This, at first sight, appears to be a huge amount of time to be invested in just one project. But it isn’t just about producing 70 minutes of music. In the September issue of Gramophone, in an article entitled “Radical Tonality”, Philip Clark has written that I am seeking “a new relationship with traditional harmonies” but that is only part of what I am working towards. I am, as ever, writing music that extends and consolidates my Non Prescriptive methods of notation, composition and performance. This is my driver, my motivation. And this exploration, this experimentation, is why my progress is relatively slow. Thinking in terms of the unknown is, for me, often painful, difficult, forbidding and, quite frankly, the very undertaking of what I am attempting sometimes terrifies me. There are not too many reference points, no models, no beaten paths to follow. It is much easier to work within given, established boundaries than to push against them. I have played some parts of the scores to a few friends who are talented musicians, players and composers. They constitute a most critical bunch, hard to please. They liked what they heard despite a performance courtesy of nine fingers and a toe-protector. Peter Vodden, who created the fractal-based image for the case of the last CD has been enthusiastically at work creating a contemporary image for this project. I have never seen anything remotely like it, it is most original. Dr. Scott McLaughlin, who wrote those highly praised sleeve notes for the last CD, visited my studio in Manchester and listened to a few, perhaps six, of the pieces. Sometime later, whilst walking and talking our way to the tram station, he volunteered to write the sleeve notes for this project. Scott teaches composition at Leeds University, he himself is a composer. He would not have offered his services if he had not approved of what he had just heard. If I can maintain my present progress, sometime midyear 2016, when the Manchester rain is warmer, I will visit Mary Dullea with the completed scores and discuss with her the requirements, demands and complexities (and there are many) of what is involved in the undertaking of the performance of the music. I apologise for not being more explicit, more open about the music per se. When I have assembled my incredible team and the project is underway I think that will be the time to enter into greater detail. This blog has been visited by people from 76 different countries. Countries that are far removed from the UK, not only geographically but in terms of economics, politics and cultures. And, as I look at this long list, it is with regret and sadness that I see so many countries that are going through a period of tremendous challenge, change and uncertainty. We are living in a deeply troubled world. As we approach the turn of the year we must hope that our political leaders will together work with an urgency and purpose to facilitate change. Change which will result in a more egalitarian, humane and compassionate global society. We have to hope. I guess that in some of the most desperate regions of the world hope is all that people have. May I offer a similar line of thought from Miguel Cervantes via the mouth of his alter ego Don Quixote, “Sanity may be madness but the maddest of all is to see life as it is and not what it should be”. It is with these thoughts and in this context that I conclude this last post of the year. I sincerely wish you all peace, good health, good fortune.